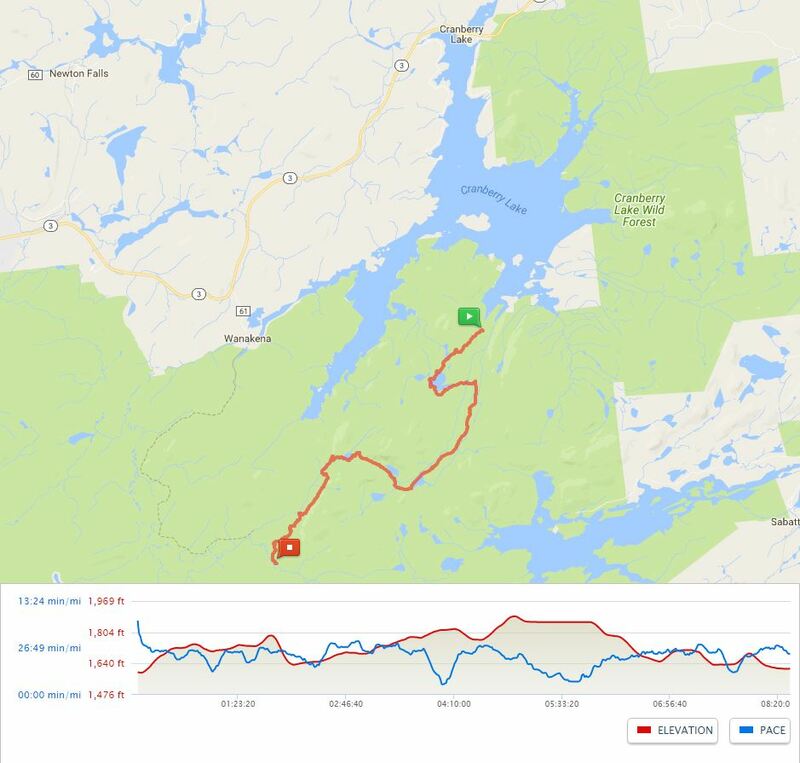 During our January hike in Moreau Lake State Park, I mentioned that I wanted to complete the Cranberry Lake 50* challenge that I had recently read about. I had never done a thru-hike before, and I figured that this would be a good jumping off point – it’s only a 50* mile loop, so no need to arrange pick-up and drop-off, nor would we need to worry about resupply stops. The only thing that remained was planning the trip, so that’s what I did … for nearly 4 months. Since I typically do the trip planning for our hikes, I set out on putting together The Plan for our CL50* trip – it was a lot of work, but it was also very fun. There are a few different trailheads that we could use as our starting point. From there, we needed to figure out if we were going to do the loop in a clockwise or counterclockwise direction. What I ended up doing was sitting with my map and the CL50* website, and figuring the trip out from 3 different trailheads in both directions, noting mileage, estimated challenge, and potential camping spots. The next big hurdle was figuring out what we were going to eat during our adventure. For me, food on the trail is a very weird thing. I don’t eat too much while I’m hiking, and then afterward we get back to the car, I am so hungry; however when we get food, I typically eat less than my normal amount. Super strange! I wasn’t really sure what to do about food for a 4 day hike, so Mark and I went to Google and found a few different sites with valuable information and suggested food lists. We came up with a meal plan that worked really, really well for our trip (each day’s meals will be in the breakdown below). In addition to the actual meals, we made sure to have enough trail mix, jerky, and other snacks to keep our energy up during the day. Needless to say, we ate really well for the most part! I woke up at 5:30am and did one last gear check to make sure I had everything, then I weighed my pack. That was a bad idea – including food and water, my pack tipped the scales at 42.6lbs. I hefted the gear into my trunk and drove up to Mark’s so that we could leave my car in a safe place and take his Jeep to the trailhead. We loaded all of the gear into the back, got Daisy situated in the back seat, and set out to the Peavine Swamp trailhead roughly two hours and 45 minutes North. We were getting a little nervous because during the drive up, it rained almost constantly, and sometimes very hard. Not that we would have turned away because of rain, but [WARNING: incoming pun] it would have put a serious damper on our mood. Thankfully we were treated to a perfect blue bird day with some light breezes here-and-there — a great day to be out in the Adirondacks! We found the trailhead parking at 10:15 and started getting ready for the hike. The first thing we did was go through the food to make sure we had everything, and then to organize it into days/meals so it would fit in the bear canister better. There was a bit extra, so we decided to just leave that in the Jeep – thankfully we really didn’t need it. Once that was all figured out we put on some sunscreen, got Daisy’s pack situated on her, applied a liberal dose of bug spray (we were already getting attacked), lifted our packs onto our shoulders, signed into the trail register, and set off for the weekend at 10:50am. The first section of our hike was on Loop 1 of the Peavine Swamp trail, and it was quite nice – a little muddy, but hardly any elevation changes (a nice way to start the hike so we could get used to the pack weight). I decided that I was going to use my trekking poles for the entire hike to help keep my legs from getting too beat up, as well as keep any blood/water from pooling in my arms and hands from the stress of the pack on my shoulders. We moved through the first 1.3 miles quickly and smoothly and met up with the new (as of 2015) West Connector Trail. While we were on the West Connector Trail (WCT), we passed some very nice looking cliffs with a lot of caves. Some sections of the WCT were in the wide open sun, but there was still mud to contend with. In fact, this was where we saw our first set of deer tracks of the weekend. Little did we know that we were going to see a lot more wildlife than we normally do when we’re hiking. After moving quickly through the ~3 miles of the WCT, we came out of the woods into a parking lot for the Cranberry Lake boat launch where we signed the second trail register of the trip. This was the start of the nearly two mile road walk on Route 3. Before we got to Route 3, we crossed a nice walking bridge that gave us a good view of the water rushing through the dam. There’s not much to say about the Route 3 road walk — the town of Cranberry Lake is small and has some very pretty houses right on the lake. We walked by the Community Library, an ice cream shop, some boat rental places, and a small beach. The 2 miles went by really quickly (I think we finished that leg of the trail in ~45 minutes), so it wasn’t too bad; however it was nice to get back into the woods at the East Connector Trail. The East Connector Trail (ECT) is another new addition circa 2015, and helped remove nearly 3 miles of road walking (which is very nice); however because it is not on the NatGeo maps, I didn’t have a very accurate measure of the distance. There is a parking area at the beginning of the ECT which we could have chosen to start at if we wanted. Before we stepped into the woods, we entered our names into our third trail register. The trail ended up being roughly a mile and a half long before it connected to the Bear Mountain trail. At this point Mark, Daisy and I decided to take a break and eat some lunch on a nice rock right next to the trail. It was nice to drop the pack, sit down and relax in the lush green forest while we fueled up a bit. After lunch, we headed East on the Bear Mountain trail (BMT) in order to connect to the Burntbridge trail. Based on the maps, we estimated that we would be on the BMT for approximately 1.2 miles … we were wrong. The BMT was 2 miles long between the ECT junction and the Burntbridge trail. The trail traveled through some very wet and marshy areas that gave us our first views of the amazing work that the beavers have done around Cranberry Lake. Thankfully there were planks to walk on for the super wet sections of the trail to keep us mostly dry. Mark and I saw our first deer on the BMT – it heard/saw us and bolted off into the woods so quickly that Daisy didn’t even notice it. The BBT is a snowmobile trail, so it was very wide and easy. This was nice because it gave Mark and I an opportunity to just enjoy the area and have a nice conversation. Many times over the weekend we chatted about trail names, and tossed a few back and forth, but nothing really stuck too well. We were supposed to be on the the BBT for ~1.6 miles, however it was a bit longer than that. We ran into a couple of pheasants that angrily chased after Daisy when she started sniffing around their nests — sometimes to hilarious interactions. Poor Daisy was also investigating a snapping turtle when it decided to let her know that it wasn’t a fan of canines — she spent the rest of the weekend cautiously sniffing rocks as we walked by them. At about 2 miles, we finally met up with the Dog Pond trail, which was the last section of trail that we’d be traveling on Day 1. We planned on being on the Dog Pond trail (DPT) for 3 miles before we reached our planned camp spot on the northern shore of East Inlet. Sections of the DPT were completely under water, so our feet got a little wet as we made our way down the trail. We also noticed that there was a bit more up-and-down elevation change than what looked to be shown with the topo lines on the map. While normally this isn’t a big deal, the heat and heavy packs started getting to us and we were already pretty tired. Unfortunately, that 3 mile section of the DPT took longer than normal because we needed to take a few extra breaks. Even though we were getting tired, we really enjoyed the few sections of the trail where we were walking right along the shore of Cranberry Lake. These views started getting us even more excited for our camp spot. At 6:27pm, we reached camp with a big sigh of relief AND a nice feeling of accomplishment. The first leg of the trip was all done, now all we had to do was setup camp, clean ourselves up a bit, get a fire going, and cook dinner! As I mentioned before, this was my first overnight, so it took me some time to setup my hammock system (I had practiced a few times at home in the backyard, but it’s not exactly the same as doing it after being tired from a long day on the trails). Mark was able to get his tent setup in a really nice spot, and then started working on the fire. We learned that Daisy really likes to make camp setup a little more challenging by grabbing things and playing “catch me if you have the energy.” We ended up having to leash her to a tree during setup and she wasn’t happy about that. When we got to camp, the waves on the lake were moving very quickly, but by the time we turned in for the night, the water was calm and we could hear the famous loons calling throughout the night. It was almost like the lake was welcoming us with a celebration, and then decided to chill out so we could sleep better. Daisy wasn’t really sure what to make of a.) my hammock setup, and b.) the sounds of the evening wildlife, but she calmed down a bit and we had a nice night’s sleep. We woke up and lazed about enjoying the views and breeze from being right on the shore of Cranberry Lake. It had rained pretty hard during the night, so this extra time gave our gear a chance to dry out a little bit before packing it up. After we packed up, we ate our breakfast while sitting on a log and discussed the day’s plan: ~19 miles to the Cowhorn Pond lean-to. As it turned out, the mileage on the signs and maps was not accurate, and we did not make it that far. The day started out with a continuation on the Dog Pond trail (DPT). Many sections of the trail were nice, but this was the section of the hike with the most elevation changes in a relatively short distance. The up-and-downs really wore us down first thing in the morning, but looking back on the day, I think that our difficulties resulted in a combination of heavy packs and tired legs from the previous day’s hike – at least that’s what I’m telling myself now. As we were walking through the woods and passing over small streams and next to beautiful ponds, we actually ran across another person. Erik was as surprised to see us as we were to see him in such a remote part of the wilderness. We chatted for a bit, and we found out that not only is Erik an avid hiker (later research shows that he’s an author as well), he also developed the Trans-Adirondack Route – a 240 mile through-hike that starts at the southern blue line, traverses north through the Adirondack Park, and terminates at the northern blue line. As of this post, only 12 people have completed the hike – including Erik. This is a truly incredible challenge that I hope to complete one day as either a continuous through-hike, or a section hike. After we completed the DPT section of the hike, we moved onto the Otter Brook trail (OBT) where we decided to stop for a bit and eat some lunch. As we were sitting down on the lunch log, Daisy sprang up because she noticed another person coming down the trail. Unfortunately, this new person was not a real fan of dogs (Daisy could sense it and was grumbling loudly about it), so we didn’t get to chat with him too much. To ease his mind, we held Daisy until he was far enough out of sight that she lost interest. I think once he had passed us, she was tired enough to just flop down for a nap anyway. This particular section of the CL50* was another wide pathway that was mostly muddy and flatish. The term “flatish” is a term that we’ve started to use for trails that are supposed to be flat based on the contour lines on the map — typically, it’s less flat than indicated. Coincidentally, “Flatish” may also become my trail name … we’ll see 😉 We ended up being on the OBT for what seemed forever. This was one of those sections where the mileage seemed a bit off – it was supposed to be ~5 miles, and I think we tracked it as nearly 7 miles. You can see in the video, we were mentally and physically tired, our feet and shoulders were sore, and the trail seemed to go on forever, so we decided that we were going to cut some mileage from Day 2 and add it on to Day 4. We were going to setup camp at either the Chair Rock Flow site, or the West Flow site. We made our way from the OBT to the South Bay Trail (SBT) where we expected to see some signage for the Chair Rock Flow site. We didn’t see any camp markers, but what we did find was an area that was tagged with a canoe portage marker. Unfortunately, because of our exhaustion, we decided not to check it out, which means we missed the Chair Rock Flow site. This was a huge bummer when we realized it, but at least we knew that we had another option available within a couple of miles. We finally made it to the junction of the SBT and the Six Mile Creek/Olmstead Pond Loop (OPL) trails where a short little 0.4 mile offshoot brought us to the West Flow campsite. Reaching the campsite happened at the perfect time – as you could see in the video, my feet were trashed. The skin on the bottom and sides of both feet was macerated and blistered — getting those boots off relieved a lot of pressure and gave me a chance to air dry. It was fairly late when we stopped for the day – I think we arrived at camp between 7:15 and 7:30pm – so even though we were hungry, we focused on getting our sleeping setups done while there was still daylight peeking through the trees. Unfortunately, the West Flow site was no where near as beautiful as the East Inlet site from the night before; however there was still water within a short walking distance and there was space for both of our setups, so it served it’s purpose perfectly. Once the tent and hammock were setup, Mark got to work making dinner, and I started the process of filtering water to drink with dinner. The mac & cheese with beef jerky mixed in was simply incredible … we’re not sure if it was because we were so hungry, or if the addition of the jerky really blew the top off of the flavor, but whatever the case, it was an amazing end to a loooooong day. After dinner, we cleaned up, and closed out the night with some whiskey sours. Day 3 started with middle of the night visit from some random hiker walking through our camp – apparently turned around from the main CL50* trail. As he walked by, Daisy woke up and starting barking from inside Mark’s tent, so I woke up just to see this guy moving down the trail heading towards the lake with his headlamp on. I knew that the CL50* was in the opposite direction of where he was headed, but a sleepy brain only allowed me to say, “hey dude — you ok?” to which I got a “yea sorry” response as he disappeared down the trail. Approximately 10 minutes later, I saw the headlamp’s light coming back up the trail. The hiker passed back through the site and back out to the main trail quickly and quietly – he was moving with a purpose. One of my co-workers became interested in the CL50* challenge while I was researching it, but he decided to try and complete it within 24-hours. Knowing that he was potentially planning to try the circuit on the same weekend as Mark and me, I realized in the morning that the hiker was likely Dan. Turns out, after I returned to work and chatted with him, it definitely was Dan – and that wasn’t his only trail detour during his ultra attempt. In the morning, Mark boiled up water for our dehydrated breakfast skillet meal, and I filtered ~8 liters of water for the day. We broke down camp, and got an earlier start than we had the previous two days, but we were sore. Before setting out, I took 1,000mg of ibuprofen to ease the pain and swelling in my feet, but we started moving before it could kick in, so the first 1/2-3/4 mile of the day was slow moving. 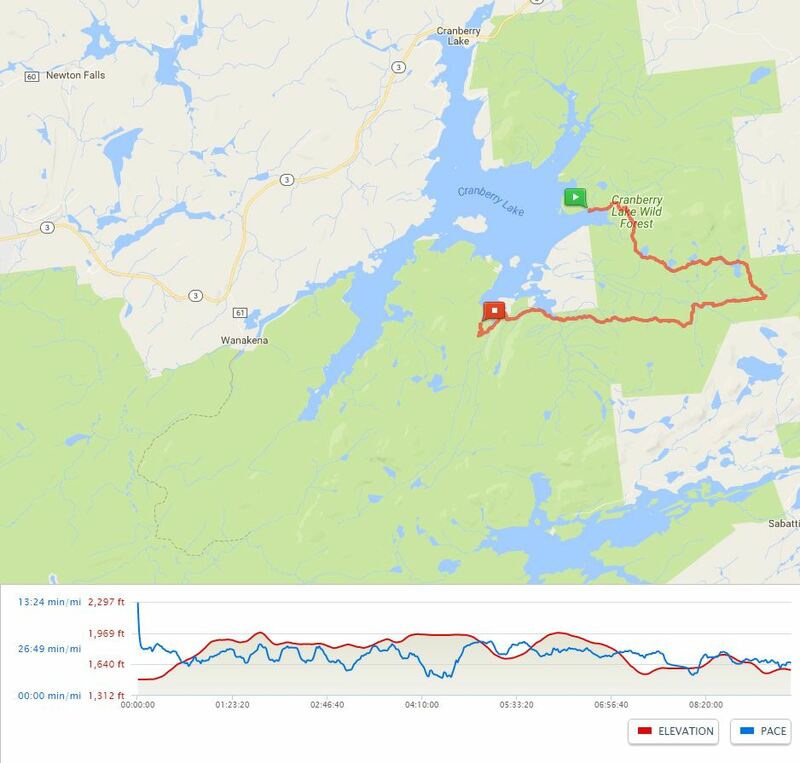 The original plan for Day 3 was to hit up Cat Mountain for a nice lunch break, then head out to High Falls to swim, and finally setup camp around High Rock – which would have left ~11 miles for our Day 4 finish. Since we didn’t make it the Cowhorn Pond lean-to on Day 2, we needed to adjust the plan slightly to accommodate both the missed miles, and the physical soreness. Knowing this, we strapped on our slightly lighter packs, and put one foot in front of the other. The first leg of Day 3 was on the Olmstead Pond Loop trail (OPL) which brought us up to a part of the trail that crosses between two small ponds (we were walking on beaver dams) where one of the ponds’ water was being held back by a dam that was nearly as tall as Mark and me. It was an incredibly cool (and wet) experience. After leaving the lean-to, the trail becomes a little difficult to follow – there weren’t many markers, and the path from other people was hard to see in some spots, but we checked our bearing and continued on. Once we saw a marker, we knew we were OK. We walked around most of the pond and were able to enjoy a lot of great views of the water. We even found a second rowboat on the other side of the pond before we started our descent. After following a small brook, we came off of the OPL trail and popped out onto the Six Mile Creek trail (SMC) where we took a break, grabbed a small snack and moved on. The SMC was fairly pleasant – a gradual incline and completely wooded. We were moving pretty quickly through this section of the hike, but we were also using up our water. Turns out that the SMC followed a ridge that was completely dry – in fact, it was the driest section of trail we were on (save roads) for the entire weekend. We eventually found the small trail off of SMC that led to the Cowhorn Pond lean-to. I checked the GPS and it was a little more than 6.5 miles past the junction to the West Flow camp site. Had we decided to (or were even able to) push through and stick with the plan, we would have traveled ~22 miles on Day 2 (we miscalculated the distance that it would have been in the video) … that would have been bad. Happy to have made the decision we did, we peeked out onto Cowhorn Pond and just kept moving. We had stopped for a quick break after passing the Cowhorn Pond lean-to trail and within 100′, we found the Cowhorn Junction trail (CJT). The CJT was supposed to be ~1 mile long, and bring us by the trail up to Cat Mountain. Like I mentioned earlier, the original plan was to drop our packs at the Cat Mountain junction, head up the 0.7 miles and eat lunch on top of the mountain. By the time we reached the actual junction to the mountain trail (which was at 2.1 miles, not one), we decided to drop our packs, eat lunch, and take a 30-45 minute rest. We were just too beat to even attempt the climb, so this will have to be another place we’ll revisit another time. I’m not ashamed to say it … that rest was probably the most amazing thing that could have happened at that moment. It felt really good to drop the weight and stretch out on the ground (or a rock) with a full belly. Unfortunately, we were running very low on water at this point, so I was on the look-out for a good water source to pull or filter from to avoid muscle spasms. At the junction for Cat Mountain, the CJT also met up with the High Falls Loop trail (HFL), which would bring us to High Falls, High Rock, and eventually to the town of Wanakena. Thankfully we found some water and rehydrated before any problems could delay our journey. The trail was beautiful, flat, and full of very awesome scenery – it was probably my favorite portion of the hike (aside from the campsites). As we made our way to High Falls, we crossed over wet/muddy beaver dams and the infamous “LOG OF DOOOOOM! !” (After our trip, I read that the Five Ponds Partners and DEC re-routed the section of trail that goes over the log of doom in case it was too difficult to pass, but I highly recommend giving it a whirl if you can — it’s a good mental and balancing challenge … especially with all that weight strapped to your back). We were trying to come up with a plan to get Daisy across the log – from our previous hikes, we know that she doesn’t like crossings like this at all – so I crossed the log first and was going to drop my pack, go back and grab Mark and Daisy’s packs to bring them across, and then we wouldn’t have to worry about funny weight distribution while trying to get her across the log. Turns out, after I made it across, Daisy decided to just go for it! After falling into the water and momentarily struggling, she zipped right across the log and waited with me for Mark to join us. We rocked it! Shortly after the log of doom we reached the junction out to High Falls – another 0.4 miles off-shoot from the main trail – where we were going to set up camp and enjoy the refreshing waterfall. There is another lean-to at the falls, and we were making a B-line for the structure, but when we got there, we found a group of older guys had taken over the site … and they had beers! For three guys, they had tons of equipment, food, and drinks. We chatted with them a bit and found out that the town’s name is pronounced Wana-keen-ah (long Es), but all three of us were ready to get relaxed after our day, so we said our goodbyes and looked for our home for the night. With the lean-to being unavailable, we were just going to setup in a clearing near the trail. It wouldn’t have been ideal – it was a bit far from the water, and there weren’t and real good trees for me to hang my hammock from, but it was only for one night, and we could make it work. Thankfully, Mark and I decided to explore a little bit closer to the water before actually setting everything up. We’d gotten to High Falls early enough that we weren’t racing daylight, nor were we starving. It’s a really good thing we explored a bit, because we found a perfect site right on the water’s edge with an amazing view, a place for my hammock and Mark’s tent, a fire pit and a bit of wood already gathered to burn. We spent about 15 minutes getting camp setup before getting changed (“BEAR IN THE WOODS!” ended up becoming our code for “getting naked, don’t look”), and going swimming. The water was cold and refreshing. The rocks were a bit slippery and the current was powerful, so we had to move slowly and carefully to avoid getting hurt, but the effort was completely worth it. Having put in 45 miles of hiking since Friday morning, it was really nice to have some water to wash the blood, sweat and stink away! High Falls is another one of those places where we would like to spend a couple of nights — in fact, there’s a popular way to canoe to High Falls through the Five Ponds Wilderness, and that sounds like something we should be planning already. After spending some time in the healing waters of High Falls, we got dried up and Mark started cooking dinner while I got the water situation taken care of. After dinner we enjoyed our nightly whiskey sours, then cleaned up and crashed. 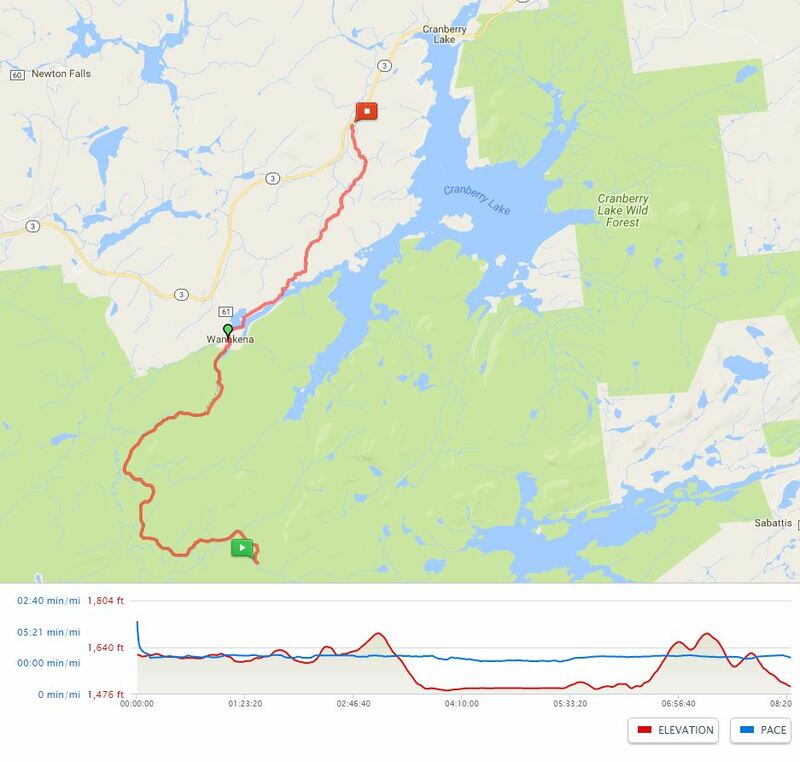 I think that the pain of Day 2 really amplified the amazingness of Day 3 – not to say that Day 3’s trek wasn’t excellent on its own, but it was just that much better after a very rough Day 2 … at least in my opinion. After a fantastic night’s sleep, we woke up to the sounds of birdsong and the water rushing over High Falls. With high spirits and sore bodies, Mark made breakfast and I filtered some more water. We then ate, packed up camp, and started the hike out — all by 8:30am. While we had a great night, we knew that we had a long day ahead of us before we could get home to a hot shower and a comfortable bed. Daisy had developed some nasty blisters where her pack’s straps were rubbing against her skin, so she went pack-free to hopefully prevent any further problems. Unfortunately, that meant Mark was carrying some extra weight. Starting out was very tough for me – the damage to my feet was causing a great deal of pain – moreso than even Day 3. The answer? More ibuprofen … a lot more! 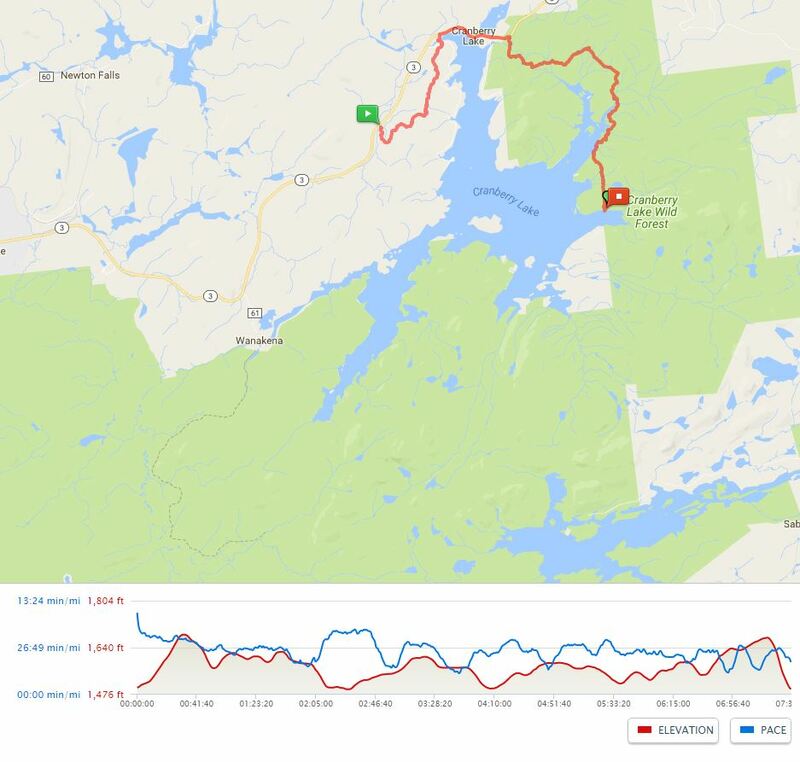 The guys from the lean-to told us last night that the mileage from High Falls to Wanakena was pretty accurate. Obviously we were hoping so, because we really wanted to get to the General Store for some fresh deli sandwiches and an ice cold drink. The first stretch of the day – 9 miles to Wanakena – was quite nice. The trail was fairly flat and wide in most parts. We did have to travel over a number of sections that were covered in water (this didn’t help my already busted foot issues), but overall, it wasn’t too bad. The walk out was super quiet, and probably the easiest bit of trail we traveled all weekend. We only saw one other person between High Falls and the Wanakena basketball courts. The ibuprofen must have worked because Mark, Daisy and I hiked the 9.4 miles from our camp site to Wanakena is less than 4 hours — we were moving at a very quick pace. When we came off of the trail, we were at the Wanakena basketball courts and needed a bit of guidance to point us in the right direction — we didn’t want to put on any more mileage if we could avoid it. Thankfully, there was a couple fixing up their deck on a nearby house that told us exactly where the new foot bridge was. We mentioned the General Store and they gave us an odd look and mentioned that it doesn’t have much. At the time, we just shrugged it off because we didn’t know what they were talking about — the store didn’t need much, just some meats and drinks. We crossed the foot bridge over a beautiful river that runs through Wanakena. The bridge is so new that it wasn’t on any of the published maps, nor did it show up on Google Maps, but it’s there, and it’s really awesome! From the bridge, we could see the solar panels on the roof of the General Store and got really excited. After crossing the bridge, we met a couple more folks, made our way to the gazebo in the town park, and dropped our packs. The woman was quite nice about it, but told me, “the General Store’s been closed for 2 years this Fall. There’s a little coffee shop upstairs, but they aren’t opened very often.” I must have looked as deflated as I felt because she apologized for giving me the bad news. There was no Wanakena General Store, which meant there were no fresh deli sandwiches or ice cold drinks … boo! We hung out at the gazebo for a bit, talked to a few passers-by, and washed up a bit in the super nice/clean public bathroom before strapping the packs back on for the last leg of the hike — Ranger School Rd to Peavine Swamp Trail, and back to the Jeep. The afternoon sun was beating down on us and then reflecting back up at us off of the road, so the 2 miles between Wanakena and the start of Peavine Swamp trail near the Ranger School was rough. The ibuprofen was slower to activate this time, and I was moving painfully slow … I imagined that I looked like an extra from The Walking Dead to all of the folks driving by. The views on either side of the road were a nice distraction. On this part of the walk we saw a lot of exposed (no longer buried) and cracked-open turtle shells in the loose gravel/sand on the side of the road. We didn’t see any turtles, but those shells were definitely a very cool consolation prize. After we passed the Range School, we reached the beginning of the other end of Peavine Swamp trail. From that point it was roughly 5 miles of cross country ski-trail back to the Jeep. I’m not sure what happened, but once we reached this trail, Mark and Daisy opened up and were moving extremely fast – I was huffing along at around 2.5 miles per hour, and they left me in the dust. Thankfully, Mark and I hike together enough to have a system – if we get separated, we wait for each other at the very next trail junction. This part of the Peavine Swamp trail was made up of a bunch of smaller loops – that we ignored as we made a B-line to the Jeep – so we’d catch up for a moment or two and then they’d be off again down the trail. When we reached the final junction – where we turned left as we started our journey on Day 1 – we all walked the final 0.3 miles together. At this point, all three of us were tired, hungry, and sore, but it gave us a few moments to reflect on what we had accomplished this weekend. Even through the fog of pain and exhaustion, we knew that we had a lot of fun, and that this was such a fantastic adventure because we’d gotten to do it together. When we made it back to the Jeep, we dropped our packs and spent a few minutes resting, changing into non-smelly clothes, and chatting. Mark learned that the protective plastic panels on the big maps at trailheads are *very* reflective (much like a mirror), and I learned that “BEAR IN THE WOODS” should be followed by a quick look around just to make sure you won’t be mooning your hiking buddies. Unfortunately there weren’t many pictures from Day 4 (we were just so exhausted), but the day was still filled with a lot of natural beauty – especially on the trail between High Falls and Wanakena. The creeks and ponds throughout that area were gorgeous, and I’d really like to re-visit them someday in a canoe/kayak. I did that because this trip actually clocked in at 61.92 miles. Granted, we can take out 0.6 miles for the small trail between where we parked the Jeep and were the CL50* loop starts, then 0.8 miles for our second campsite, and another 0.8 miles for our third campsite, but that *still* means that we hiked 59.72 miles … just a bit more than 50 miles. It turns out (and you’ll notice this in the video/picture slideshow on YouTube) that the NatGeo map and trail signs consistently misrepresented the mileage – at least for the first 3 days; the mileage for day #4 was actually pretty accurate. Normally when I use MapMyRun for a day hike, it is accurate to within a tenth of a mile, so I don’t believe that the app miscalculated our distances – I think that the trip is just a bit longer than noted. With all of that being said, I still had a fantastic weekend. Even though I ended up going to Urgent Care and a podiatrist to get my feet checked out, and to get some meds for any infections, I would gladly take this trip again … only next time, I’d suggest 5 or 6 days to fully enjoy the area! While planning our trip, I read plenty of articles and posts, as well as watched some other folks’ videos and knew that there is a lot of wildlife throughout the Cranberry Lake area – including bear and moose. While we didn’t see any bears or moose, we did see evidence of their cohabitation in the area – bear prints in the mud, and “chocolate eggs” on trail. I will say, I was very surprised and extremely happy with all of the different types of wildlife we saw throughout the weekend — that’s something that we don’t usually see either because of our talking, or because Daisy ends up chasing it away, so it was an awesome part of the experience. Now that my feet are healed and I’ve been OK’d to get back on the trails, Mark and I are going to continue moving forward on our trek to become ADK 46ers. We’re hoping to hit the 1/2 way point sometime between the end of August and the middle of September. Until then, happy hiking! Just did the CL50 using the new map published by Five Ponds Partners. The map is missing the guide book and trails for which there are signs along the way.